I’ve recently had the privilege of leading our church through one of the most wild and wooly episodes in the Bible’s story: the period recorded in the book of Judges. It’s been a fascinating and at times depressing ride; Judges is filled with chaos and violence and characters who promise so much but often fail to deliver. But through it all God remains unbelievably faithful, and by the end of the book it’s only a miracle of his grace that his people survive at all. Othniel was God’s instrument, God’s chosen deliverer who had God’s Spirit on him. But Jesus is God himself come to save, who not only has the Spirit of the Lord on him but who pours out his spirit onto his people. Othniel was a good judge, the best judge, but in the end he went to his grave, just like Ehud, Shamgar and the rest. But Jesus, our great deliverer, isn’t dead. He defeated death. He didn’t just bring rest to one piece of land; he has won a universal rest in the new heavens and new earth that he is bringing in. And His victory goes on, not just 40 years, but forever. By his spirit poured out on us, and through his word given to us, he is just as much with us today as Othniel was with the Israelites. And isn’t that something to sing about? Isn’t that something to celebrate? Isn’t that something to rejoice in? 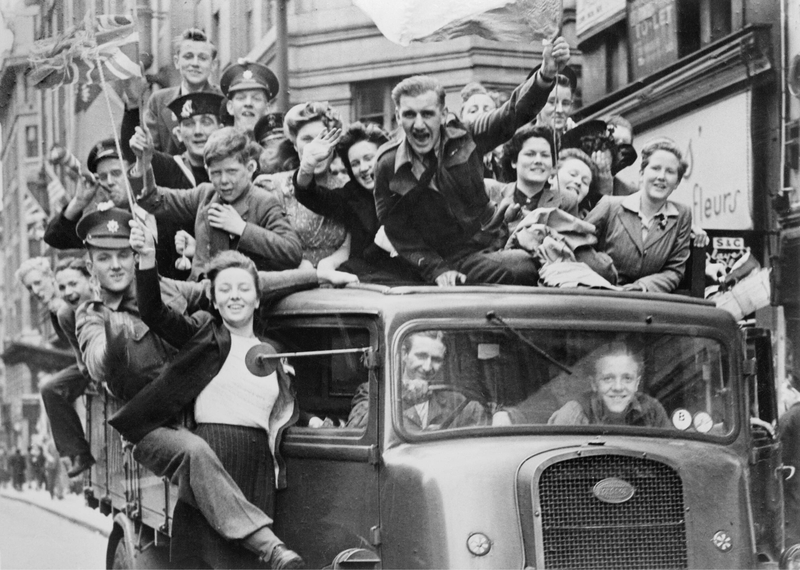 The people who celebrated VE Day were just so happy and full of joy. They sang because they knew two things: the horror of the enemy, and the certainty of the defeat. It’s the same with us, living in the victory of God. But if the reality of God’s victory in Jesus doesn’t fill us with joy, it may be on the one hand because we’ve forgotten the horror of our enemy. Our world is very good at sanitising sin, at hiding death behind closed doors, at making light of the devil. And it’s hard to really rejoice that Jesus has defeated sin when we’ve sanitised it, death when we’ve hidden it. But these are terrible enemies. Doubly wicked doesn’t being to get at it. They are the enemies that have enslaved and destroyed and distorted all humanity ever since the fall; and in Jesus they are defeated! But perhaps on the other hand you are all too familiar with the horror of enemy. You know the cruel sting of death, the destructive consequences of some sin, some enslaving idol. It’s the certainty of their defeat you struggle with. And it’s hard to rejoice in God’s victory when you aren’t sure of that victory. In this world we will have trouble. Lots of it. But in Jesus we may have peace. He has overcome the world. He has promised to return, to wipe every tear away and make all things new. So take heart. Rejoice in the great victory of God given freely to you in Christ.